Private and Group Music Lessons on Piano, Strings, Woodwinds, Brass, Guitar and Voice. For all ages and levels. Tuition is payable in advance and is due at or before the first lesson. It may be paid in full or in 2 equal installments. There is an annual registration fee of $25. There are 17 individual lessons (15 for Monday students in the fall semester) and one group lesson per semester. An annual $25 registration fee is required. Full tuition may be paid in advance or in two equal installments. First tuition payment is due on or before the first class, second payment is due November 13, 2018. Registrations are accepted for full term only or for full remainder of the term in case of late registration. Final payment will be adjusted for late registration and teacher's absences. No refund will be made for a student's absence from private or group instruction with less than 24 hours notice. Only two make-ups per semester are allowed. A limited number of scholarships are awarded to applicants who evidence need and motivation. Young children love the sound of your voice. Come sing, dance and make music! This class is for children 18 months through 4 years, with a parent or caregiver. Each class will include songs, rhythmic play, percussion instruments, circle games, a snack and a story. This one hour class will provide a stress-free, playful introduction to singing and movement, which can lead to a lifetime of musical enjoyment. Dalcroze eurhythmics teaches the basic musical concepts of rhythm, pitch and form through joyous movement, song and use of percussion instruments. This is an ideal class for children who are not sure which instrument to choose. A lead teacher will enhance basic musical skills with instrumental visitors giving hands on opportunities to try piano, guitar, violin, cello and recorder. 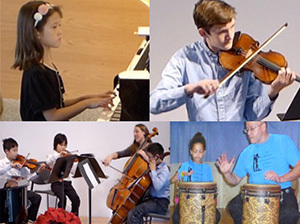 Creative music theory classes are musicianship classes complementing instrument instruction. Music theory can be fun and can build confidence when eager young artists are shown a direct, practical music application! Ear training is a big part of music theory class. Through games and other resources, students will be taught to hear and recognize, pitches, intervals, and chords. Students will learn scales, key signatures, basics of harmony and rhythm. The ultimate goal of creative theory is to produce a literate musician, able to understand, read, and write music. Vocal ensemble for those who love to sing! Singing lifts your spirits and can lead to a lifetime of good health and happiness. Singing with correct technique will enhance all musical skills and is an essential part of a musician's development. Repertoire will be carefully selected to suit children's voices and interests, with music from across the centuries. Small groups of strings, winds, with or without piano, come together to play an independent line and make music. Jazz is sometimes seen as a mysterious language. But like any language, it can be learned. For all instruments. Think of Blue Man Group! Develop self-discipline, creativity, and become part of a musical team. Electronic music composition classes. Requirements: lap top computer with Garage Band installed and headphones. Will be offered on Saturday mornings. Come find your inner groove and expand your musical horizons! For adults—everything you always wanted to know—but were afraid to ask! For adults who can read music and love to sing! For adults who love to sing! All styles, no experience necessary.